If the gun is held too close to the object, the paint will not get the opportunity to distribute itself sufficient. If one is equally against the paint jet the light like you see in the distance the paint distribution is optimal.This distance must be maintained during spraying. When working with a worn nozzle (nozzle or tip), you get in the center of the jet too much paint and the paint distribution will not be good, so get a new nozzle. When working with a nozzle with a spray angle is too narrow, there must many jobs exactly are sprayed adjacent to a connecting plane to ranges. In practice, this is very difficult and will almost always cause uneven coating. Large areas are usually with a spray angle of at least sprayed 50 degrees. When spraying is necessary to release the trigger after each spray movement. If one constantly by spraying without releasing the trigger, you get the turns a place with extra thick paint so that no uniform the surface is established. How to spray with an airless spray gun. Keep the airless spray gun at approximately 30 cm from the surface to be sprayed and keeps the right on the surface to be sprayed. 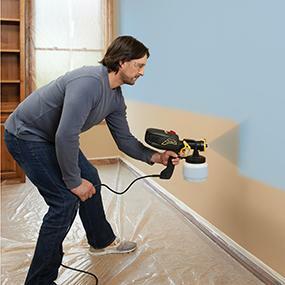 Move the airless spray gun parallel to the surface to be painted, make sure that the distance to the surface to be sprayed remains the same plus or minus 30 cm. Manual for the spraying of large areas. If one sets even higher demands on the surface to be sprayed can correct any jobs or stripe effect by overlapping the jobs for half. Even better is to apply the second layer then crosswise. Orange Apple Effect. Too low spray pressure. Increase spray pressure. A lot of spray. Too high spray pressure. Too thin material. Reduce the spray pressure. Too much material yield. Excessive nozzle. Spray pressure too high. Use a smaller nozzle. Reduce the spray pressure. Too little material yield. Too small nozzle. Take larger spray tip. middle v / d range. Worn spray tip. Wrong spray tip. Replace spray tip. Spray Pattern uneven. Nozzle soiled. the object being sprayed from. Drops along spray tip. Gasket or damaged tip. Renew gasket. Nozzle will soon close down No gun filter gun.